A newsletter to provide timely, research-based information that commercial fruit & vegetable growers can apply to benefit their farming operations. You will need the free Adobe Acrobat Reader to view this file. Address any questions or comments regarding this newsletter to the individual authors listed after each article or to its editors, Nathan Johanning, 618-687-1727, njohann@illinois.edu or Bronwyn Aly 618-382-2662, baly@illinois.edu. The Illinois Fruit and Vegetable News is available on the web at: http://ipm.illinois.edu/ifvn/. To receive email notification of new postings of this newsletter, contact Nathan Johanning at the phone number or email address above. Check the Illinois SARE calendar for a full list of programs and links for registration. http://web.extension.illinois.edu/smallfarm/ and the calendar of events at http://web.extension.illinois.edu/units/calendar.cfm?UnitID=629. Produce Safety Alliance Grower Training, April 12, 2019, University of Illinois Extension Office, 818 S. Park, Hardin, IL 62047. Do you have concerns about safety in your produce operation? Are you concerned whether you need to comply with the Food Safety Modernization Act Produce Rule? Do you want to know more about the difference between FSMA and GAPs? Then the Produce Safety Alliance Grower Training might be for you! For more information or to register (by April 1): https://go.illinois.edu/PSAHardin2019 The PSA Grower Training Course is one way to satisfy the FSMA Produce Safety Rule requirement outlined in § 112.22(c) that requires ‘At least one supervisor or responsible party for your farm must have successfully completed food safety training at least equivalent to that received under standardized curriculum recognized as adequate by the Food and Drug Administration.’ In addition to learning about produce safety best practices, key parts of the FSMA Produce Safety Rule requirements are outlined within each module. There will be time for questions and discussion, so participants should come prepared to share their experiences and produce safety questions. Costs ($75.00) include PSA Grower Training Manuals, handouts, AFDO Certificate of Course Attendance, and lunch. Certificates are required for individuals looking to meet the conditions of the FSMA Produce Rule. Questions can be directed to Laurie George at (618) 242-0780 or at ljgeorge@illinois.edu. 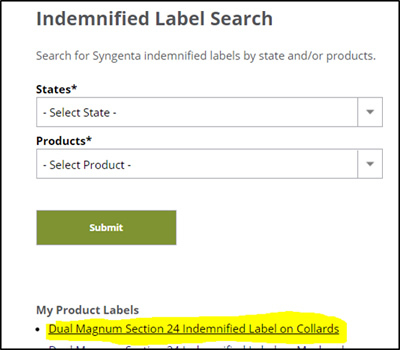 I just received word from Syngenta that Illinois Department of Agriculture approved our request for additional crops to the Dual Magnum indemnified 24c label this past Tuesday and it is now available through www.farmassist.com for growers and applicators to access and download. Be advised that with an indemnified label, you assume all risk of crop injury, crop yield reduction and crop loss. In addition to pumpkins, the indemnified label now includes use on Asparagus, Garlic, Leek, Green Onion, Transplanted Bell and Non-Bell Pepper, Transplanted Broccoli, Highbush Blueberry, Elderberry, Blackberry, Red and Black Raspberry, Carrot, Cucumber, Broccoli, Chinese Cabbage, Collards, Kale, Mustard Greens, Turnip Greens, Cabbage, Transplanted Eggplant, Garden Beet, Parsnip, Radish, Turnip, Rutabaga, Muskmelon, Cantaloupe, Watermelon, Okra, Dry Bulb Onion, Spinach, Swiss Chard, Winter Squash, Sweet Potato, Summer Squash, and Strawberry. To access this label, users are required to go to www.farmassist.com. Helpful site instructions can be found at https://web.extension.illinois.edu/mms/downloads/79141.pdf. This label is good through March 25, 2024. Step 5: On the drop down menu, select the desired crop from the drop down menu and then hit submit. 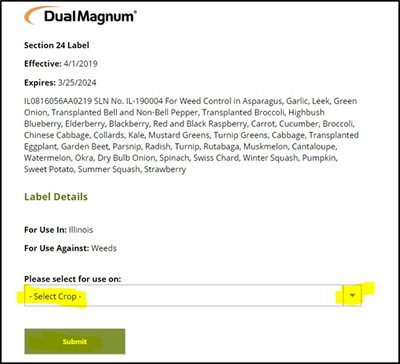 Regardless of which crop is selected, you will get the single label with all the crops listed. Step 6: Scroll to the bottom of the next screen and accept the indemnified language. 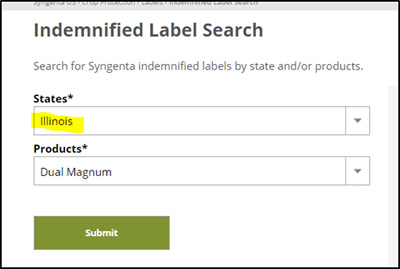 Step 7: Find the label in your list of products and click the link. 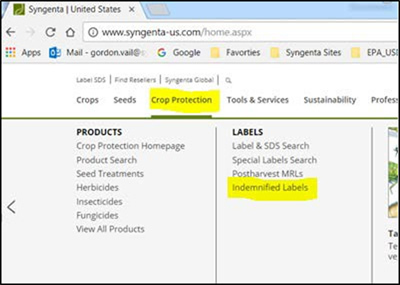 The title of the label will reflect the crop you selected in the drop down menu in step 5. Once you click on the label, you will get access to the pdf version of the label. 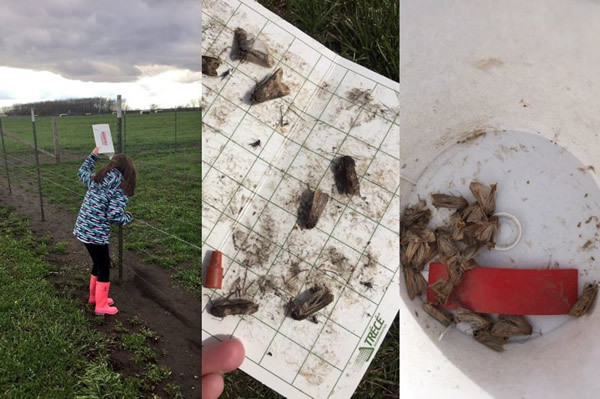 We are starting to look for cooperators that are willing to place and monitor traps for black cutworm and true armyworm this spring and European corn borer, corn earworm, fall armyworm, and western bean cutworm this summer. We provide traps and lures. We ask cooperators to place and check traps several times a week, reporting trap catches to our site. We will also be looking for cooperators to participate in our summer field surveys as well. This survey is done entirely by the Illinois Cooperative Agricultural Pest Survey Program. Each year, we have conducted a corn and soybean survey, but will also be adding an invasive species component this year. As part of our CAPS program, there are several invasive corn and soybean pests that are a threat. Included in that list are the old world bollworm, Egyptian cottonworm, soybean gall midge, cucurbit beetle, brown marmorated stink bug, and kudzu bug in addition to western corn rootworm, soybean defoliators, and other pests. Tar spot of corn and bacterial leaf streak of corn will also be surveyed for. If you are interested in learning more about either of these activities, please email Kelly Estes, kcook8@illinois.edu. From St. Louis metro-east… We need some warmth and a break from rain. Soil temps are still on the cold side, registering 42.2°F on bare soil at 2”, and 39.3°F at 4”. On the fruit side, strawberry covers are coming off again following two chilly nights dropping just below freezing. Growers in the area have 2-3 fungicide sprays on for early season control of anthracnose. Captan applied at weekly intervals is still your best option. Strobilurins (FRAC 11) may be on the way out due to increasing reports of resistance coming in on planting stock. Some have successfully planted new tree fruit blocks while others are holding trees, waiting for drier conditions. Early apple cultivars like Lodi and Braeburn are at 1/4” green and oil sprays are on. Peaches are showing signs of buds swell, but as you move south some are showing pink but no open blooms yet. There will be a peach crop, though some growers have reported variability in bud survival. Some are reporting bud loss but not enough to ruin a potential full crop, and any bud loss so far would have been thinned off later. More than one grower reported having a little bit of everything…some trees with no bud survival, while others are showing no apparent cold injury. Some trees have live buds only in the top of the trees and growers are adjusting their pruning in order to preserve a crop. Notes from Brad Taylor, Southern Illinois University. Do not compound your problem. Failure to prune a peach tree in a light crop year can have a lasting effect, including a migration of fruit production to the upper canopy over time, reduced fruit quality and a lengthened harvest window...also a reduction in winter hardiness and next year’s fruit size potential. For 4-6 year old trees that still have limber branches heading to the top. Open up the canopy. Thin out vertical, vigorous (leggy) shoots without flowers buds. Keep the shoots with flowers without heading back. Assume the fruit load will bend branches and expose interior to the sunlight. In the bottom 1/3 of the canopy, identify 1 year old shoots at the 10 and 2 o’clock positions for renewal shoots. Cut back by 1/2 to 2/3 to a healthy bud about 1.5 feet apart. Summer prune early to remove water sprouts in the center of the canopy. There is an increased likelihood of peach canker and loss of scaffolds beyond the migrations of fruiting wood to top of the tree as a result of over-shading, effectively prematurely aging the tree. For mature trees with shoots at the tops which have stiffened up: If you do hedging, come through immediately to cut out deer antlers and anything growing into the center. If you must keep extra wood to keep a crop, keep the fruiting wall as thin as possible, i.e. early removal of water sprouts to maintain an open center. Failure to prune a peach tree in a light crop year results in reduced fruit quality and lengthens the harvest window, plus reduces winter hardiness and next year’s fruit size potential. Reminder: there is a twilight meeting for tree fruit growers scheduled for April 11th at Bryan Matthews’ Orchard from 5:30 to 7:30 PM. Located at 1493 Blue Ridge Road, which is north of Hardin, IL, and approximately halfway between the Illinois and Mississippi Rivers. Register at https://web.extension.illinois.edu/registration/?RegistrationID=20091. If you need special accommodations or have additional questions, contact Ken Johnson at 217-243-7424 or kjohnso@illinois.edu. On the vegetable side, sweet corn planting will begin any day now. Horseradish growers are digging to fill orders but new planting have not started yet. High tunnel planting ongoing, including tomatoes. From east central Illinois... Wet, very wet. Farmers are only able to work in high tunnels. Some early crops have been planted on well drained areas before the last series of showers. 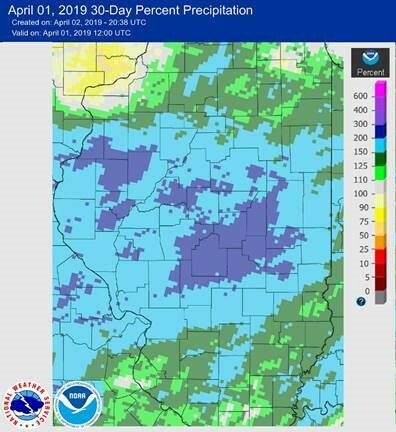 Here in the central part of Illinois, we have had 150-300 percent of normal rainfall. Picture shows March rainfall. From Dixon Springs Ag Center…Since planting cucumber transplants in both the hydroponic and ground bed high tunnles, the temperatures have dipped at or below freezing several times. Row cover has been placed over the tender young plants to keep them from suffering cold injury or death. This past weekend saw nighttime temperatures reach into the mid to upper 20s but the cucumber plants were not damaged. This morning we actually observed several plants with tiny cucumber fruit beginning to form. In another few days cucumber training and clipping will need to begin to get the vines started growing up the single string used to trellis or support the plants. We may have fresh cucumbers to eat during Easter dinner! Bed preparation and steaming across all 8 beds in the Farmtek tunnel will be complete after today. Tomato transplants are ready for planting and that will begin later today or tomorrow. We plan to conduct a replicated variety trial on both tomatoes and peppers within the ground bed (Farmtek) high tunnel. 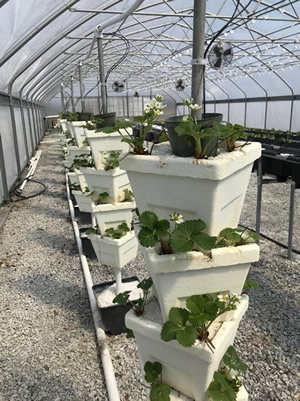 Hydroponic strawberries in the vertical stack system are starting to set their first flower clusters. Tomatoes will soon be planted in the hydroponic systems as well. Hopefully by next week, the lettuce table will be up and running and our first round of lettuces and asian greens will be starting to grow. 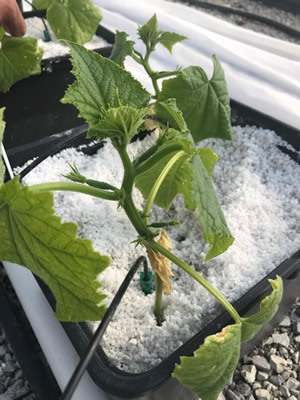 Cucumber fruit forming on plants planted March 19, 2019 in the hydroponic tunnel at DSAC. 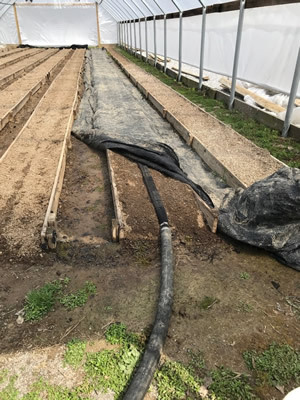 Steaming completed in the next to last bed in a tunnel at DSAC in order to eliminate potential soil-borne disease pathogens and weeds. 10. Tired of Endlessly rehearsing so-called "ad-libs"